The conventional wisdom is that the best way to introduce a new cat or kitten to a resident pet is to put the two together and let them sort it out themselves. When a 6 week old kitten was introduced to Doug Smith's family cat, Minou, the adult cat boxed the kittens ears and chased it into a corner. The terrified kitten wet itself. Having established who was boss, the two became good friends and even hunted co-operatively. While the "sudden introduction" may be successful for some animals, it is more likely to cause stress and physical injury. The sudden introduction may result in a fight. The loser may simply leave home or, if confined indoors, may retreat to one room as far away as possible from the other. The more dominant personality may continue to bully it for as long as the cats live in the same household (at this point, an indoor-outdoor cat would probably leave home). Having retreated, the loser is likely to develop behavioural problems such as house-soiling. The worst case scenario had been the death of the cat or kitten when carelessly introduced to a dog that is not used to cats and not used to sharing its territory. The problems can be frequently be avoided by carefully managed introductions. Introductions can be quite nerve racking. Even if your intention is to get another pet to keep your current cat or dog company after the death of a previous companion animal, your current pet is less likely to welcome a newcomer with open paws! Some cats (and dogs) have very laid back temperaments and may welcome newcomers, especially if the newcomer is young or more submissive in temperament. However, for the safety of the existing residents and the newcomer(s) alike, they should be introduced carefully until you are certain they have accepted each other. The following guidelines and hints have been drawn from the experience of various people, including myself, and can be adapted to suit different household situations. Hopefully they will help you to introduce a new cat or kitten to your existing pets with the minimum of stress and anxiety for all parties - including yourself. Caution: Most cats will accept a newcomer given time, patience and understanding. However, sometimes a newcomer will not settle or the resident cat(s) will refuse to accept him (him means "him or her" throughout this article). Perhaps your existing cat(s) are fiercely territorial or possibly the newcomer, though friendly with people, cannot tolerate other cats (or not tolerate a dog). If this happens, you should seriously consider rehoming the newcomer otherwise all of the pets will become stressed and may develop behavioural problems. If the newcomer cannot tolerate other pets, make this clear when you return him to the animal shelter or you seek a new home for him. This article deals first with cat-to-cat introduction and general advice on settling in a new cat. Cat-to-dog introductions are dealt with further down the page. The number of cats in a single household depends on their personalities, the available space and your ability to keep the house hygienic. Cats, even sociable cats, like their own space. Overcrowding will cause stress and some or all of the cats will become ill or cranky as a result. Most readers will have heard of "cat collectors" or "animal hoarders" who have too many cats in too little space and who are soon overwhelmed by the task of cleaning up. 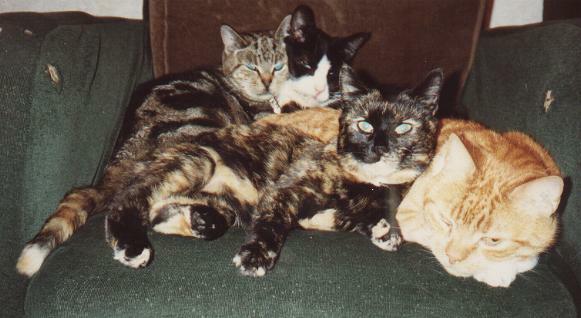 As a rough guide, the average British 3 bedroom house can accommodate 2-3 cats without causing overcrowding. More than this depends on the cats' personalities. Unlike dogs, cats have not evolved to be pack animals. Many cats are quite happy to be solitary even if the owner prefers to have several cats around. The likelihood that a cat will accept a companion depends on its individual personality. At one end of the personality spectrum, a confident, extrovert cat is more likely to be friendly and to settle well. He is also more likely to accept others readily. His outgoing personality means he will approach newcomers with curiosity rather than mistrust or jealousy. At the other extreme, a timid, introverted cat will be cautious and more fearful of strange cats. He may be more aggressive towards another pet. It may take weeks of carefully managed short meetings, persuasion and bribes before a timid cat is confident enough to remain in the same room with the newcomer. Most cats fall between these extremes. In addition, some cats simply will not tolerate other cats in their territory and will fiercely defend the territory against the intruder. There is no point trying to force such cats to be sociable as it will make all parties unhappy and your house is likely to become a war zone. Some cats, though they do not become best of friends, will live alongside one another in a state of truce. There may be smack-fights if they encounter each other unexpectedly e.g. in a doorway, but otherwise they tolerate or ignore each other. Provided there is no competition for food or sleeping places, the house remains harmonious. Conversely, some cats form close bonds with each other, playing, sleeping and even hunting together. Conventional wisdom states that cats will more easily accept a feline newcomer of the opposite gender as this reduces competition. If the cats were both neutered before sexual maturity, the genders are less important. It is also usually advised that resident cats will better accept younger feline newcomers as the youngsters pose less threat. This depends on the personalities involved. A kitten or young cat may be too overpowering for a sedate oldie. With a bit of common sense, cats have accepted newcomers of all ages. If you keep geriatric cats and plan to introduce another oldie you may find they have lost their competitive streak and are far more interested in regular mealtimes and warm, comfortable sleeping places than in asserting their authority over each other. Introductions should be done at a quiet time when the household is calm and will remain calm for a few weeks. Avoid busy times such as parties or visits from relatives or friends. This does not mean your mum can't pop round for a cup of tea, it refers to visits extending into several days when you will have less time for interacting with pets. Ideally, give the new cat his own room to begin with. He needs to settle in to this "safe room" before meeting other pets. The room must be made escape-proof and safe. Block any chimneys/fireplaces and if it is necessary to open a window for ventilation, fit a mesh panel (make it secure so that the cat cannot dislodge it). If the room has a cat flap, make sure it can be physically blocked, not merely locked shut. The best way to block it is to fit a sliding panel over it, either one that can be locked into place or on the OUTSIDE of the door. Switch off gas or electric fires and make sure there are no cables to be chewed (or they are tucked out of the way). Kittens have a special tendency to get under-foot or become victims of their own curiosity and lack of common sense. In a busy household they can easily get trodden on, tripped over or otherwise injured. A safe room is essential except when the household is quiet and you can watch or supervise them. If your home is the sort where some rooms have glass panelled doors, it would be an advantage if the safe room is one of the rooms. This allows the newcomer and the resident pets to look at each other through the glass. Don't worry if you don't have such doors as there are plenty of other ways to start the introductions when the time comes. A windowsill or a seat allowing a view through the window are more important - the cat will want to start surveying his new territory and getting used to the comings and goings of others. The safe room must be equipped with a cat bed or some description (a blanket-lined box, old armchair etc are fine if you don't have cat baskets). A hiding place (e.g. under the bed or a large upturned box with a hole in the side) is also essential as cats like to hide while they take stock of their new surroundings. Food and water bowls are essential. The litter tray should be placed as far away from the cat's sleeping place and the feeding place as possible. Like us, cats don't want to sleep and eat in the toilet (particularly in a toilet that can't be flushed). A scratching post or pad is advisable as are some toys. If you think the room gets cold at night, there are a wide variety of heat-pads (electric, microwavable, simple thermal pads or fleeces) available or you could use a hot water bottle wrapped in towel. A battery radio (or mains powered if the cable can be tucked out of the way) tuned to a talk station (e.g. UK's Radio 4) can be used to provide company when the cat is in the room alone. Preparations need not be elaborate - just common sense! If a safe room isn't possible because of lack of rooms or an open plan home, the alternative is a kitten pen (or kittening pen). Kitten pens are metal mesh pens approximately 1 metre x 1 metre square and 0.75 - 1 metre tall. They are collapsible and have plastic bases that are easy to clean and prevents the occupant from scratching the carpet in an attempt to dig his way out! The dimensions vary depending on the supplier. Some of the large dog crates that fit inside estate cars are suitable as long as the occupant cannot escape through the mesh and there is enough room for bed, food, water and litter tray. Large chinchilla cages might also suitable as long as its door is large enough. If you are only using the pen for short introductions (e.g. to a dog) then a smaller crate with a blanket in it will be fine as the newcomer will be spending most of his time in the safe room. It is possible to make your own kitten pens so long as there are no protruding bits of wire to cause injury. Whatever type cage you use, the door must be able to be shut securely (if in doubt, a strong bulldog clip usually does the trick). The cat inside the kitten pen can see what is going on around it, but feels safe inside the cage. To make a kitten pen feel more secure, at least to begin with, you can put a sheet, blanket or curtain over the top and around two or three sides. One side should be left uncovered so that the newcomer and the existing residents can see each other. They will want to sniff each other through the mesh, try to put a paw through and will probably hiss or growl at each other. However they cannot attack or physically intimidate each other. Unless the newcomer is a stray who has been coming in through the cat flap and has made his own arrangements with amicable resident cats (and this is surprisingly common!) you will need to prepare for arrival day. Make sure the safe room or kitten pen contains all the necessities detailed earlier and whatever optional extras are common sense. He may want to hide away to begin with, in which case leave him alone for a few hours to explore in his own time. If he actively explores the room while you are there and he wants attention, by all means sit in the room (floor level or cat height is best) and talk to him, or pet him if he comes to you for fuss. Don't force him to interact with you though - there will be time for that later on and it is better for him to come to you. Instead, spend time with existing pets so that the newcomer is not seen as a threat to the attention they are used to. When you spend time with the newcomer, try to do so at his level so that he can come to you for petting. Talk gently and move slowly - take things at his pace. To begin with, he may wish to sniff you, but not be stroked. Don't be alarmed if he hides under furniture or in his bed - even if he seems to be dozing, his mind will be processing the new sights, smells and sounds around him. Leave him in his hiding place - he will come out in his own time. Don't trying to force him out as he will become frightened and you may be injured. Unless you are expert at reading feline body language, don't crawl under the bed (or wherever) with him to give him fuss as he may feel threatened. As long as he eats, drinks and uses the litter tray (be patient about any early accidents which will be due to nervousness) he will be fine. Some cats take longer than others to settle into a new environment. At first you may wish to keep the existing pets away from the door in case they, or the newcomer, become anxious. However they will almost certainly start sniffing each other through the gap under the door. If you've adopted your new cat from a shelter or a friend, you should have some idea about the diet he is used to. Try to feed him at the same times (as far as your household routine permits) and on the same food - if the same brand is not available or affordable, try to stick to the same flavours at least. Once he's settled in, you can start varying his diet, but to start with he has more than enough new experiences to cope with! For the first few days he might be off his food a little, in which case a little boiled fish or cooked chicken might tempt him. Don't disturb him while he is eating (this includes not vacuum cleaning right up to the other side of the door). When he eats in your presence, this is a sign that he has accepted you. Water should be available all the time. The litter tray should be cleaned after use if possible or twice daily (morning and evening) if this isn't possible. Use a type of litter that is familiar to him. If he isn't used to litter, you may wish to use earth though this is not ideal (earth can be sterilised in a baking tray in a hot oven before use). A few accidents are to be expected, but if he consistently fails to use the tray then it is most likely in the wrong place (too exposed, too close to food, water or bed) or the type of litter is unsuitable. Sometimes the smell of detergent or disinfectant may put cats off. More rarely it is marking behaviour. Some cats are so interested in their new surroundings that they simply need a couple of reminders about where the tray is so they can get there quickly though this is not usually a problem in a single room or a pen. One suggestion for reinforcing litter tray behaviour is to remove the solids as usual, but to leave wet patches in the litter for 24 hours to build up an odour association. Sometimes a little of the wet litter needs to be sprinkled onto the clean litter after you have cleaned the litter tray. When he seems ready i.e. he is exploring his surroundings, seems relaxed and is hiding only occasionally, you can start handling him properly. Not all cats enjoy being lifted or held, but are happy to sit beside you to be stroked or groomed. These are boundaries that the cat will set, though he may relax them over a longer period of time. You have to respect these boundaries. You can also let other human members of the family introduce themselves to the newcomer one at a time (supervise younger children). Stroking and fussing helps to mix scents. After stroking the newcomer, stroke your existing pets. After stroking your existing pets, stroke the newcomer. This way all the scents mix on all the animals to establish a "household scent" or "family smell" (if you have dogs, the dogs understand it as the "pack scent" which distinguishes between "part of my family" and "not part of my family"). Scent mixing allows all members of the household to recognise each other as family. Gather scents from around the cat's head area by gently stroking it with a soft cloth. You can then wipe this cloth over furniture, door-posts and other pets. After a day or two, take an item of bedding from the new cat's room and an item from an existing cat's bed and exchange them so that the cats can smell each other. Sacrifice some old towels or t-shirts if they don't have loose bedding. If possible, rub them down with each others bedding so the smells mingle. Some people swear by rubbing the cats down with catnip (to give them a common scent) before any face-to-face meetings. If the cats have been able to see each other through a glass door, they will probably already have sized each other up and read each other's body language. Hopefully you will already have some idea about how they will react to each other when the door is opened. If it is possible to use a screen door on the newcomer's room so that the cats can see and sniff each other but not touch, that is helpful. They can be allowed to meet through the screen or mesh after about a week. If not, the first meeting should be carefully supervised with the cats being distracted with food treats so they associate the meeting with rewards. Some hissing and spitting is normal and they are each likely to retreat to a safe place to think things over. If, each time the cats meet, there is immediate serious fighting (e.g. with one cat ending up on its back) rather than just nose-smacking and ear-boxing then things are unlikely to work and it is unfair on your existing cat to force them together. You can expect growls and hisses while they sort things out between themselves. Always give your existing cat reassurance as it is his territory and you are asking him to accept an interloper. If you are using a kitten pen then the resident cat can have free access while the newcomer is in the pen. Over several days they will gradually get used to each other. At first, feed both cats at the same time, but with the newcomer inside the pen and your existing cat outside the pen. You can then start letting the newcomer out of the pen, perhaps feeding both cats in the same room. If early meetings deteriorate into fights or chases, with one cat seeking a safe hiding place, then things are very unlikely to work out, however hard you try to make the cats accept each other. You will need several supervised meetings (2 or 3 times daily) with each meeting being longer than the previous if possible. A good result is when the cats ignore each other. A superb result is when they groom each other or settle down together. If they do get on at this point, you can let the new cat spend more of his time out of the safe room, maybe just keeping him in there at night for the next several days until you are certain that there won't be any fighting. The new cat also needs to explore some more of the house while your existing cat is restricted to one room with a member of the household to fuss him so he doesn't notice the temporary confinement (or some toys and food to distract him). This allows the newcomer to explore without feeling threatened. You'll need to do this several times while the new cat learns the house layout and smells and while the existing cat gets used to the new smells the newcomer leaves behind when he rubs against things. At this point, if the existing cat goes crazy (rather than just being inquisitive) about the new smells then it may not work out. Either cat might spray once or twice as a signal to the other (this is annoying, but should be cleaned e.g. with biological clothes washing powder dissolved in hot water), but if the spraying is frequently repeated then the cats are unlikely to accept each other. When the new cat is allowed the run of the house, the cat flap must be locked shut and all windows securely shut or screened with mesh or there is a risk of losing him. When the newcomer is introduced to other cats you can expect some or all of the following: the cats may freeze, bristle the fur along their backs, puff up their tails to appear larger, show their side view (so they look bigger than they really are), flatten their ears, growl, hiss or paw the floor. Most of this is bluff as cats prefer not to risk getting injured by fighting. They are sizing each other up. These initial reactions are usually sorted out by eye to eye contact and quite possibly a lot of swearing and the odd smacked nose or boxed ear. Once they've stared each other down, they will work out the hierarchy as one cat retreats extremely slowly. Make sure there is an escape route for the retreating cat. Just in case of actual serious fighting (which happens if neither cats backs down), it's a good idea to have a blanket ready to separate the cats without risking injury yourself or a water pistol to distract them from fighting long enough for you to separate them. Introductions at meal times are generally calmer as the cats are focussed on the food and not on each other though there may be some growling regarding ownership of food bowls. Cats can't fight and eat at the same time, but they can still swear and eat at the same time! Once they begun to accept each other you can let them eat together as this usually reinforces or hastens their acceptance of each other. You may wish to put an obstacle in between their feeding bowls to begin with so that they can't properly see each other. Gradually move the bowls closer together until you can eventually remove the obstacle. An extrovert newcomer will quickly find and accept a communal eating place, but less confident cats generally prefer to eat at a distance for a while. However, if you use their favourite foods and offer it to both cats at the same time, they will usually overcome their caution of each other (they may even sniff or lick each other after the meal). Eating together helps integration, especially if the cats associate communal eating with their favourite foods! Don't expect the cats to become close buddies, especially not at first. They will find their own sleeping spots around the house and may choose to avoid each other for much of the time. Their tolerance of each other may increase dramatically when food is available or when it's cold or wet outside, but warm and cosy in the living room. Once they show signs that they are not going to fight or chase, but instead find their own sleeping spots and meet each other without aggression, then they can be allowed to cohabit without supervision. For most cats this only takes a few weeks. Sometimes it may only take a few days. For other cats it may take a lot longer. However, the longer the cats go without tolerating or accepting each other, the less likely the are to ever accept each other and it is far wiser to rehome the newcomer rather than try to force the issue. The cats may have "only cat" personalities or, if you already have more than one cat, one or more cats may be unable to cope with an increased feline population in the house. If your cats have access to outdoors you will eventually want to let the newcomer explore the garden. After 3 or 4 weeks, he will know that your home is his home and he will recognise the smells and the other animals that live there. Before allowing him outside, make sure he has a collar on (even if he is microchipped) so that he can easily be returned if he does get lost. The collar can be dispensed with once he is fully acquainted with the outdoor part of his territory. First introductions to outdoors should be before mealtime (he won't want to go far and risk missing a meal) and you should leave the door open so he can see an obvious route back into the house. If you are concerned that he will stray or is not confident, get him used to wearing a harness while he is still indoors. His first introductions to outdoors can be on a harness and leash and you can accompany him round the garden. He will want to scent mark it by rubbing his cheek on twigs or fences, and possibly by using one of the flowerbeds as a toilet. Scattering some of his used litter (i.e. litter scented his urine) on flowerbeds and at the garden boundaries may help make him feel that your garden is his territory. Many owners, particularly those near busy roads, fence in part or all of their gardens. Though many cats stay away from traffic noise, not all cats have good road sense (particularly if there are fields or woods on the other side of the road) and a fenced garden is a wise precaution. It also protects your cat from straying dogs. Dogs and cats are often portrayed as natural enemies. The usual problem is a clash of body language. When a cat runs, the dog's instinct to chase often takes over. When a cat raises a forepaw it is to swipe another cat, but to a dog it is a sign of play. When a cat waves its tail it is a sign of high excitement, frequently anger, but to a dog it is a sign of friendliness. The two species misinterpret each other's body language until they learn it. It is often much easier to introduce a new cat to a dog than to another cat. Though both animals will initially be wary of each other, they do not view the other as a competitor. A dog that is used to cats may be excited when a new cat is introduced, but he will usually quickly settle down and the novelty will wear off. Dogs are pack animals and, if the introduction in properly managed, he will consider the new cat as part of his pack. Many dogs live happily with their own household's cats but will chase strange cats out of the garden, so you must ensure that the new cat is seen as part of the pack. If the new cat or kitten has previously lived with a dog, it is less likely to be frightened (or at least not frightened for long) and will soon become confident around the dog. Many kittens and bolder adult cats take charge of the situation immediately and boss the resident dog around from the moment they meet. Many dogs can actually be terrified of the new kitten or cat! The cat or kitten may puff up its fur in an attempt to look bigger. Hissing and growling are not unexpected as the cat warns the dog not to bother it. Reassure the dog and keep it calm - the noisy intruder is not going to attack it - and especially keep the dogs from sniffing the cat at this stage otherwise it will learn the hard way and end up with its nose clawed! Ensure the safety of the cat and the dog when introducing them. You need to control the situation until the dog and cat have got used to one another. Stroke the dog and cat separately but without washing your hands to exchange and mix their scents. This is especially important to make the newcomer gain the "pack scent". A kitten pen is a good idea for first meetings to keep the situation calm and the cat protected from an excitable dog. The dog can sniff the newcomer through the bars and get over its initial excitement. Although the cat may growl, hiss and spit, the pen protects it. If you have a secure pen large enough for the cat's food, water, bed and litter tray then you could put the cat in this at night in the room where the dog sleeps to allow them to get used to each other for a few days to a week. The time it takes for them to get used to each other depends on how used to cats the dog is. Excitable dogs, or dogs that have not been used to cats, require more careful handling when introductions are made. Obviously, it is not advisable to introduce a cat into a household where an aggressive or very territorial dog may harm it. If the dog is excitable or energetic, it is advisable to take it for a vigourous walk to burn off some of its energy so that the meeting remains calm. At first, the dog must be kept on the lead, kept as calm as possible and made to sit quietly. The new cat should be given a safe position in the room and allowed to get used to the dog and to approach it if it wants. Many cats will approach the dog out of curiosity if it remains calm though this may take a long while and requires a lot of patience. Usually, the dog is more eager to introduce itself, but the cat may regard a direct approach as a threat. If the dog behaves well, it should be rewarded. If the dog is quieter or used to cats, the introductions may be made using a strong cat carrier. Again, keep the dog on the lead or keep a firm hold of its collar, at least to begin with. Place the carrier on a high surface and allow short, frequent but controlled introductions. Most dogs soon calm down when they realise that the newcomer is not particularly interesting. The cat and dog can then meet outside of the carrier, but with the dog on a lead until it again loses interest. Unless the individual dog is very placid or used to cats, hunting/chasing breeds, sight hounds and terriers will need to be kept well under control until they have learned that the cat is not "fair game". Dogs have a strong instinct to chase and while the individual may not intend to harm the cat, in catching the cat it may accidentally fatally hurt it (dogs instinctively shake what they catch). Young pups are also likely to get very excited and may try to play with the new cat. 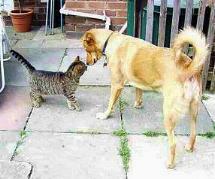 The cat is unlikely to want to join in, at least not until it is more confident, and the pup may get its nose swiped. Don't punish the cat. The pup has learnt a valuable lesson - over-enthusiastic approaches are unwelcome. The cat has taught the pup that it is not a toy and the pup will have learnt to respect the cat's boundaries. Keeping things calm may be hard work as a sudden dash from the cat is likely to trigger the dog's chasing behaviour. Praise your dog for staying calm and sitting quietly and reward its good behaviour with food treats. The dog will come to associate the cat's presence with calm behaviour and with rewards. When you progress to introductions with the dog off the lead, make sure there are high places the cat can escape to where it will feel more safe if the dog becomes noisy or over-enthusiastic. Never leave the dog and cat together unattended until their behaviour shows that they are safe together and that the dog will not treat the cat as prey or as a toy. Once the cat(s) and dog are established as pack-mates you will have to bear a few things in mind. The cat's food will be tempting for the dog; if possible feed the cat on a ledge out of the way of your scavenging canine. Though it sounds gross, many dogs will eat the excrement of other animals. The contents of the litter tray can also be tempting for a dog so keep the litter tray out of the dog's reach if it is likely to eat the cat's faeces. If you are concerned that the newcomer and the established cat will end up chasing each other (not a good start for a feline relationship) and you don't have access to a kitten pen, then you can make initial introductions using a cat carrier. Unlike a kitten pen, the cat cannot stay in the carrying basket for long, but it can be used for relatively short introductions. Place the newcomer in the carrier and let your existing cat come into the room. Place the cat carrier above ground level so that the cats are not forced to make direct eye contact with each other (direct eye contact is a sign of, or can trigger, aggression between cats). When the existing cat comes into the room, give it plenty of attention and calm reassurance. It may decide to run away without investigating the new cat in the carrier. If so, don't force meetings, but let it take meetings at its own pace. It is usually a sign that the cat will not become aggressive towards the newcomer. Most likely it will stay out of the way and gradually accept the new cat over a period of time. If the cats show signs of aggression towards each other, distract them with a noise and calmly reassure them. They will associate non-aggression with reassurance and attention, and with nice titbits, from you. Be careful not to reward aggression. Once you decide to let the newcomer out of the carrier so that it is free in the same room as the existing cat, do so at a mealtime as food will be a distraction. You may decide to delay the normal mealtime for an hour or so to ensure the cats are hungry and likely to concentrate on the food instead of on each other. Choose a room where either cat can get out of the other's way or can hide. Put down the resident cat's food and put the new cat's food some distance away (they don't want to be in each other's faces right away) then let the newcomer out of its basket to eat. Afterwards, the cats may choose to investigate each other or may look for separate sleeping places (this is also a good sign). If they show signs of aggression towards each other, you will need to keep them separate for a bit longer and feed the newcomer in its basket (in the same room as the existing cat) a few more times before you repeat the out-of-basket mealtime introduction. Once they show signs that they are not going to fight or chase, but instead choose their own favourite sleeping spots and meet each other without aggression, then they can be allowed to cohabit without supervision. For most cats this only takes a few weeks. Sometimes it may only take a few days. For other cats it may take a lot longer. The longer the cats go without tolerating or accepting each other, the less likely the are to ever accept each other. They may have "only cat" personalities or, if you already have more than one cat, one or more cats may be unable to cope with an increased feline population in the house. Such cats should not be forced to live together as it will only cause stress for all parties, including yourself. Where the cats cannot accept each other, it is kinder the rehome the newcomer however much you may have wanted him. Firstly, be sure that you are adopting a genuine stray and not somebody's indoor-outdoor pet. Many cats enjoy multiple homes, ensuring that there is alternative accommodation if their real owner is on holiday or working late. Some spend their day enjoying the hospitality of several households while the owner thinks his cat is out hunting! Genuine strays tend to look unkempt, nervous and may be unneutered. Before becoming attached to an apparent stray, get the vet to check him for a microchip or ear tattoo. Check with the local animal shelters and any notice-boards in case there is a "Lost Cat" notice that matches the stray's description. If no immediate owner can be found, place an elasticated collar on the stray with the note "Am I a stray?" and your phone number. Not all owners are observant, especially if their cat is notorious for roaming, and it may be days or weeks before anyone contacts you. At the time of writing I have a "time-share" cat who wore a collar and "am I a stray?" tag for 6 weeks before anyone phoned me. By that time the cat had more-or-less moved in and both households are resigned (amicably) to a time-share cat. Before taking in a stray, get the vet to give it a health check and flea treatment so that it doesn't bring illness into your household. If it has been surreptitiously moving in while you are asleep or at work, many of the introduction stages will already be over. By then, your own cats will either have accepted it or driven it away. The newcomer may have managed the initial stages of meeting (either indoors or in the garden) without your knowledge, in which case allowing it to move in is merely a formality. If it has previously been shooed outdoors or been unable to enter the house, you will need to follow one or other of the introduction methods detailed above as your existing cats may have been willing to share their outdoor territory with the stray, but need to get used to sharing their indoor territory as well.